El Galan’s Dona Nieves cigar is named after Mesa’s grandmother, who worked in Cuban tobacco fields until she was 86 years old (and clearly remains a strong influence on Mesa). Even the three vitolas—including the box-pressed Negra Macha (5.5 x 54)—are all nicknames for Mesa’s grandma. 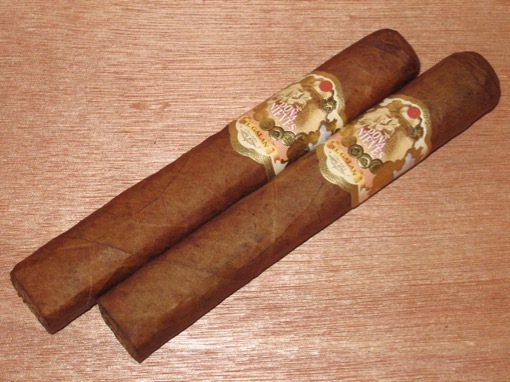 The cigar uses an Ecuadorian Habano wrapper around Nicaraguan binder and filler tobaccos. It isn’t easy to find, but you can locate it online for around $6. The cigar features intense pre-light aromas, including barnyard with light fruit. It is densely packed with a light box press and a light brown, slightly splotchy wrapper. Once lit, the Dona Nieves produces a complex array of flavors that include burnt toast, shortbread, cinnamon, nutmeg, white pepper, and cafe-au-lait. It’s full-flavored and medium-bodied. Construction is excellent with a sturdy ash despite a slightly wobbly burn line. If I’m being honest, I picked up these cigars on a complete whim just because a Nicaraguan-heavy, Ecuadorian Habano-wrapped cigar made by a Cuban sounds a lot like some of the other cigars I’ve liked over the years (e.g., early Don Pepin and A.J. Fernandez). I’m glad I did. This is a flavorful, complex, well-made, balanced smoke at a very fair price. If you’re looking for something new to try, check out El Galan Dona Nieves Negra Macha (since you probably haven’t smoked it yet). It was a pleasant surprise for me and earns four and a half stogies out of five.